Andor first introduced an Intensified CCD camera into its range in 1995. Indeed Andor was the first company to offer a fully integrated ICCD which included a high performance delay generator, a high voltage gating unit and camera unit all built into an ICCD camera. Intensified CCD’s are also cameras which can exploit gain to overcome the read noise limit but also have the added feature of being able to achieve very fast gate times. The gating and amplification occurs in the image intensifier tube. Image intensifiers were initially developed for night vision applications by the Military but increasingly their development is being driven by scientific applications. The Image intensifier tube is an evacuated tube which comprises the Photocathode, Microchannel plate (MCP) and a Phosphor screen, and the properties of these determine the performance of the device. The photocathode is coated on the inside surface of the input window and it captures the incident image: see the diagram on the right. When a photon of the image strikes the photocathode, a photoelectron is emitted, which is then drawn towards the MCP by an electric field. The MCP is a thin disc (about 1mm thick) which is a honeycomb of glass channels typically 6-10 µm, each with a resistive coating. A high potential is applied across the MCP, enabling the photoelectron to accelerate down one of the channels in the disc. When the photoelectron has sufficient energy, it dislodges secondary electrons from the channel walls. These electrons in turn undergo acceleration which results in a cloud of electrons exiting the MCP. Gains in excess of 10,000 can readily be achieved. The degree of electron multiplication depends on the gain voltage applied across the MCP which can be controlled in the camera. 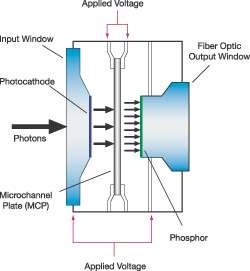 The output of the image intensifier is coupled to the CCD typically by a fiber optic coupler: see diagram below. Fiber coupled systems are physically compact with low optical distortion levels. The high efficiency fiber optic coupling means that the image intensifier can be operated at lower gains, and this in turn results in better dynamic range performance from the image intensifier (better than 15 bit). An alternative coupling method is to use a lens between the output of the image intensifier and the CCD – a ‘lens-coupled ICCD’. This has the advantage of allowing the image intensifier to be removed, thus enabling the CCD to be used alone for unintensified applications. With a suitably high quality image intensifier, the lens coupled arrangement can also produce a better quality image as the fiber-to-fiber variations and blemishes are removed from the system. Disadvantages of lens coupled systems are larger physical size, lower coupling efficiencies and increased scatter. Specialist power supplies are needed to operate the Image intensifier. To achieve fast Gating a high voltage pulser must be used which can pulse 200V pulses with sub-nanosecond rise and fall times. To set the gain of the MCP a stable voltage must be applied typically in the range of 600 to 900 volts. 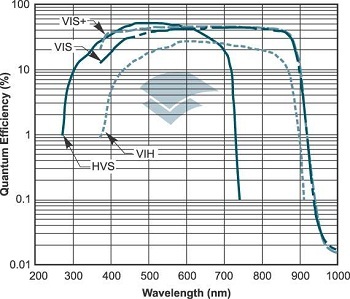 To achieve good sharp images the phosphor voltage must be typically 4kV -8kV depending on the phosphor and tube type. The spectral response of an ICCD camera is primarily determined by the photocathode material used in the Image Intensifier. There are a number of intensifiers routinely used in the scientific applications and they have been classified in relation to the Military classifications that originally developed them. The early intensifiers were classified as Gen II intensifiers. Gen I intensifiers used a different construction which didn’t use a MCP and are no longer in regular use. Gen II intensifiers use Bi or Multi Alkali Photocathodes. Gen III intensifiers are now replacing Gen II intensifiers for most military purposes and use a semiconductor photocathode. Gen III filmless photocathodes are a more recent development which Andor brought to the market. All of these Intensifiers have useful properties for scientific imaging or spectroscopy and are therefore offered by Andor. Their relative properties are highlighted below. 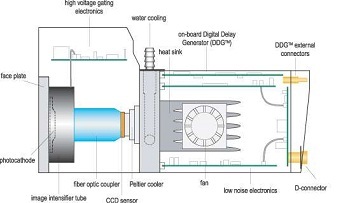 A Gen II intensifier incorporates a Bi or Multi Alkali photocathode which are the same materials used in the photocathodes of Photomultiplier tubes. Gen II photocathodes are typically applied to a quartz window which allows the photocathode response to extend into the UV (~180nm). The quartz window can be substituted for a Magnesium Fluoride window to provide response into the VUV (~120nm). The mix and thickness of the photocathode can be ‘tuned’ to optimise the wavelength response in different regions. Andor offers three standard Gen II options, the ‘W’ intensifier which is optimized for the visible wavelength region, the ‘WR’ intensifier which is optimized for the near infrared region and the ‘WU’ option which is optimized for the Ultraviolet region. A Gen III intensifier incorporates a semiconductor photocathode which is made from Gallium Arsenide (GaAs). The photocathode is only available on a glass window which limits the spectral response to wavelengths greater than the 350nm. The Gen III intensifier provides good spectral response from the visible to near infrared. The Gen III intensifier photocathode is very thin and delicate and is prone to being poisoned by impurities in the image intensifier tube. This was particularly a problem when used in the harsh conditions needed by the Military. To protect the photocathode a thin coating of Aluminium is put down over the input to the MCP. This layer prevents impurity ions being accelerated back from the MCP damaging the photocathode and hence this lengthens the lifetime of the image intensifier. The protection layer has a drawback however as it presents a barrier to the photoelectrons emerging from the photocathode, which must be overcome. To penetrate the barrier the photoelectrons must be accelerated by a much higher electric field, typically of the order of 1000V, as opposed to the 200V required for a Gen II tube. There are two consequences of this protection layer, first it increases the Noise Factor arising from the amplification process and hence limits signal to noise ratio. Secondly the higher voltages place a bigger burden on the gating circuitry to achieve short gate times so gate times are typically 2 to 3 times slower than a Gen II intensifier.A Gen III filmless intensifier also incorporates a semiconductor photocathode which is made from Gallium Arsenide (GaAs) but typically the photocathode material is doped to ‘tune’ the response to particular wavelength ranges. The photocathode is also available on wide wavelength response glass to allow more blue response. As the name suggests the filmless Gen III is really a Gen III without the MCP protection layer. With the improvement in production processes and for the scientific market lifetime Gen III lifetime is no longer an issue. Removing the protection layer eliminates the issues with higher Noise Factor and slower gating times. Andor offers two Gen III film-less intensifiers, one which is tuned more to cover the visible and near infrared region VIH (360-910nm) and another which is tuned to cover the visible band with more blue response HVS (270-740nm). The noise and hence sensitivity of the ICCD is also governed by the Image Intensifier. The image intensifier amplifies the light signal so that the CCD section of the camera no longer dominates the noise of the camera. Hence an ICCD can be viewed as a camera with effectively no read noise. There is still a dark current component which originates from thermally generated charge in the photocathode and as this is occurs before the amplification stage, it will also get amplified. The dark current in image intensifiers was traditionally called the Effective Back Ground Illumination (normally abbreviated to EBI). The dark current is generally not an issue when using short gate times. A more thorough analysis of noise and signal to noise ratio for all cameras is contained in another section. A real advantage of an ICCD camera over EMCCD’s and CCD’s is their optical shuttering properties. The Image Intensifier can be operated as a very fast optical switch, capturing an optical signal in billionths of a second. By applying a negative voltage, typically < -150V for a Gen II Intensifier, between the photocathode and MCP, photoelectrons generated in the photocathode are swept out of the photocathode, across the gap and into the MCP for amplification. The intensifier is therefore gated on. By applying a small positive voltage, typically 50V, the photoelectrons cannot cross the gap and no signal is seen. The intensifier is therefore gated off. The minimum time taken to gate the intensifier from being off to on and then off again is called the Minimum Gate time. 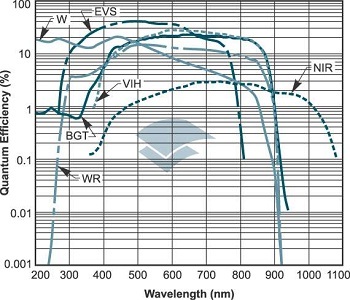 The Minimum Gate time depends on a number of factors but principally on the structure of the Photocathode and the electronic gating circuitry. Gen III filmless can be gated in times less than 2 nanoseconds (ns). Gen III filmed as stated before are typically longer ~5ns. Gen II photocathodes are also usually slower, typically 50ns, but by applying a thin metal underlay gating times less than 2 nanoseconds are also possible. Applying the underlay will sacrifice some of the QE properties of the photocathode. Gen II and film-less Gen III intensifiers can also be gated in sub nanosecond timescales with special Gater units. The Intensifier can be repetitively gated at rates of up to 50khz for standard operation or up to 500kHz for specially requested cameras. Although the CCD section of the camera cannot be readout at this rate, there are advantages in operating the optical gating independently. A repetitive signal can be sampled and the output of the intensifier summed on the CCD to integrate up a larger signal that otherwise may not be visible. 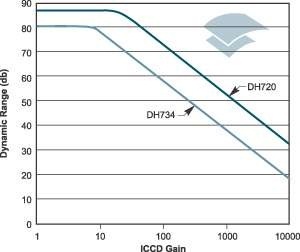 The dynamic range of the ICCD is governed by the CCD section and varies with the Gain of the ICCD. A higher dynamic range CCD used in the ICCD will result in a higher dynamic range ICCD camera. See below for typical measurements. On this graph you can see the dynamic range of the CCD determines the initial dynamic range of the ICCD camera. As the gain increases the smaller signals that can be accommodated is compensated by the lower read noise to keep the dynamic range constant. When the read noise drops below a single photon level the dynamic range of the ICCD starts dropping as the gain increases further. One point of note here is that you have to be careful on the choice of phosphor used for high frame operation. The standard phosphor on an Image Intensifier used for ICCD’s is called a P43 type. This phosphor has the optimal light output to be detected by a CCD, however the phosphor is relatively long lived. When a group of electrons hit the phosphor in an instant, light is emitted from the phosphor over the subsequent period of time. The light decays in a non-exponential manner so after 1ms it decays to 10% of its initial level and after 10ms it decays to less than 1.0%. If we are using a high frame rate operation which is reading out 100 frames/second, 1% of the signal from first frame will appear in the second and so on.To remove this time integration effect it is better to use a fast phosphor. Andor recommends a P46 phosphor for this operation. A P46 phosphor has a lifetime of 100ns for the light level to decay to 10% of its value and 2µs to decay to 1.0% of its initial level and hence will reduce the overlapping effect in fast frame readout. The light emission of the P46 phosphor is not as well optimized to the CCD readout but this can be overcome by using a higher gain on the Image intensifier. An ICCD camera has lower resolution than a CCD camera. The main reason is again the Image Intensifier, see the figures below, where the image on the left is taken using a CCD camera, while the one on the right is using an ICCD camera. In the image intensifier the MCP and phosphor both make a major contribution to degrading the MTF that a bare CCD would have. Recent developments in finer phosphor deposition, reducing gaps and reducing the bore of the Microchannel plates has resulted in much better performance but typically resolution is limited to less than 60 line pairs/mm.See Andor's range of ICCD cameras in the Andor iStar product section.